← How Much Do Teachers Make? For example, in the health care law, there existed a provision that stated companies had to fill 1099’s for each vendor or supplier that they did more than $600.00 worth if business with. When folks began to complain, lawmakers felt a touch foolish and offered to up that amount to $1,000.00 or even $5,000. But think about it. It;s not the limit that’s the problem, it’s keeping track to begin with. Because the only way for me to know, and to prove if audited, that I haven’t done $600 worth of business is to record everybody. Anyway, that provision was struck and is now fixed. But here’s another one. 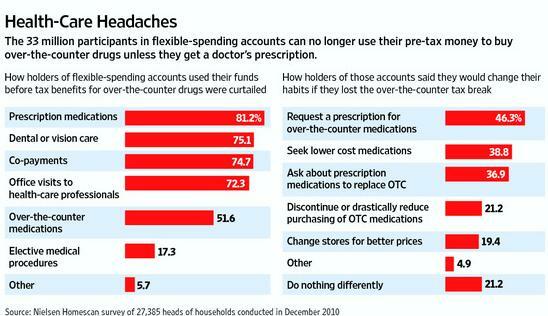 In the past, folks have been taking advantage of tax free medical accounts. These little honeys allow you to designate a pool of money that will be used for health care, medicine and other medical needs. That money is spent tax free. You don’t owe taxes to the government on that money. The health care law changed all that. Now, rather than just keeping track of your purchases, the government requires you to have a prescription for those purchases. Can you guess what’s going on? Patients are demanding doctors’ orders for over-the-counter products because of a provision in the health-care overhaul that slipped past nearly everyone’s radar. It says people who want a tax break to buy such items with what’s known as flexible-spending accounts need to get a prescription first. Yup. In an effort to reduce costs, the government has INCREASED costs. And wait times as doctors have to make themselves available for an office visit from a mother who wants to buy diaper cream. When Dianna Greer of San Diego and her son came down with a cold, she wanted a $13 bottle of NyQuil and daytime cold medicine—and she wanted to pay for it by tapping the $5,000 in her flexible-spending account. Ms. Greer says her doctor wouldn’t write prescriptions without an office visit, so she went without the drugs. Later, she got the prescriptions from a doctor at the emergency room, where she was diagnosed with pneumonia. She wanted to use her tax free money to buy a $14 bottle of medicine. The savings to her was at most, if she was in the highest tax bracket, 6 bucks. Instead she went without and because of that got sick and had to go to an emergency room. The exact method of medical care delivery we’re trying to reduce. Wanna see how much people will change? 46% of the people who have these accounts will now go see a doctor for a prescription. 46% of 33 million? 15,180,000 more doctor visits. Each with a cost associated measured either in time or in dollars. 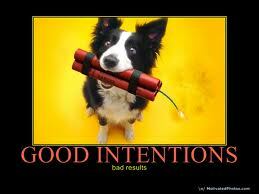 Intentions are fine, results are measured. This entry was posted in Economics, Government, Health Care, Idiots on Parade, Politics: National and tagged Barack Obama, Incentives, Incentives Matter, Left, Liberal, Politics, Taxes. Bookmark the permalink. While we may disagree on the benefits of the health care bill overall, I definitely agree with you here. There are parts of this bill such as what you just described that make no sense at all. It’s a great example of how a bill can become convoluted and bloated when everyone with some sort of special interest gets their hands on it. I definitely agree with you here. I often say that folks mostly agree. Everyone wants to have more people insured and less people on the streets unable to to afford medical care. Them are the intentions. How we do it is the sticker.